I have owned three books by the late composer John Cage (1912-1992) for many years. The most recent was published in 1972. On very rare occasions–probably less than once every few years on average–I pick up one of these books and, in appropriately stochastic fashion, read something at random. Without exception this exercise proves to be at least interesting, often humorous, or even more often astounding. Last night as I was heading for bed I snatched my copy of A Year From Monday and began reading the introduction. This statement seems prophetic, but he and McLuhan were not talking about the future. Cage was talking about his now: 1967. 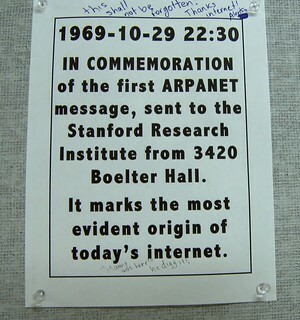 ARPANET, the precursor to what we now know as the Internet, did not exist until 1969. The first hand-held cellular telephone was demonstrated in 1973. Small CATV networks have existed since around 1950, but were primarily built to provide clear signals from over-the-air local broadcasters. Specialized cable-only programming networks distributed by satellite appeared in the 1970s. What Cage was talking about in 1967 as electronic technology consisted basically of hard wired telephones, broadcast television, and radio. There were no other popular electronic communications media at that time. But McLuhan’s message about the immediate transmission of information shrinking the planet into a “global village” was a revolutionary observation on the heels of the first transatlantic television and data signals broadcast via the Telstar satellites in the early 60s. More recent advances in technology have accelerated McLuhan’s thesis, resulting even then in the awareness of “Future Shock,” as Alvin Toffler’s popular 1970 book so clearly enumerated. So Cage’s logical extension of McLuhan’s idea is that consciousness itself has become decentralized. And this has now become a way of life for anyone who uses technology to discover, store, retrieve, or share information. We are inextricably tied to our technologies in ways that make us more connected, arguably more productive, and ultimately more dependent on each other as segments of an intellectual and social network. A network in which it is becoming more difficult to distinguish between that which is “me” and that which is “not me.” And perhaps this comes from Cage’s Zen perspective, observing that experience is inclusive–as music is not separate from the environment in which it is played, so we are not separate from the social and information networks within which we live and think. Though how one might practice Zen meditation via a social network is a puzzle, perhaps. I have a small desk in my living room that is covered with trinkets. I think of it as a sort of shrine. There are a few Mexican objects not related to each other and for no reason other than that they came to me in various ways: a dark wood carving that belonged to my father of a seated monk reading from a book, a Oaxacan Dia de los muertos skeletal figure carving with a colorful sombrero and playing a fiddle, a native woven basket, a votive candle depicting the Virgin of Guadalupe. Also on my shrine are pictures of people I admire–a sort of personal pantheon. These include Buddha, Bodidharma (a watercolor I made myself after a Japanese original), Jimi Hendrix, Bach, Fred Rogers (AKA Mr. Rogers), and most certainly John Cage.